Something a little different today! I was inspired by a photo I recently saw on Tumblr, and just knew I had to recreate this nail art look. It's such a playful design; perfect for the summer months and upcoming music festivals here in the Southern Hemisphere. You will need: 1. A base & top coat. 2. 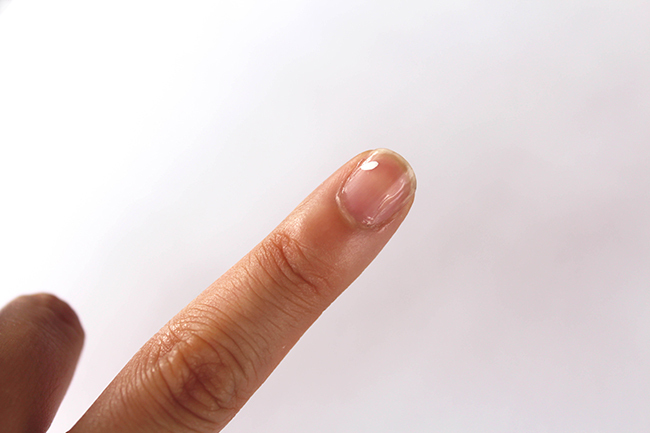 A white nail polish. 3. A yellow nail polish. 4. Toothpicks. 5. A bobby pin (optional). 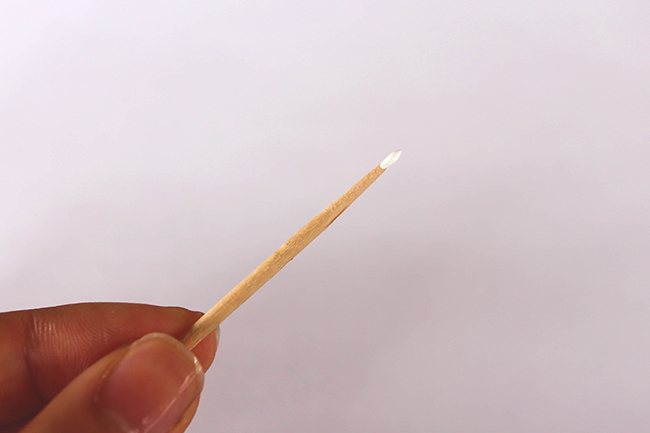 Pour a little white polish onto a piece of paper, and dip the end of the toothpick into it so that it picks up a little bit of polish (as pictured). Alternatively, you can dip the toothpick into the polish bottle itself, or use the brush to add some polish to the end of the toothpick. Make sure not to put too much on! 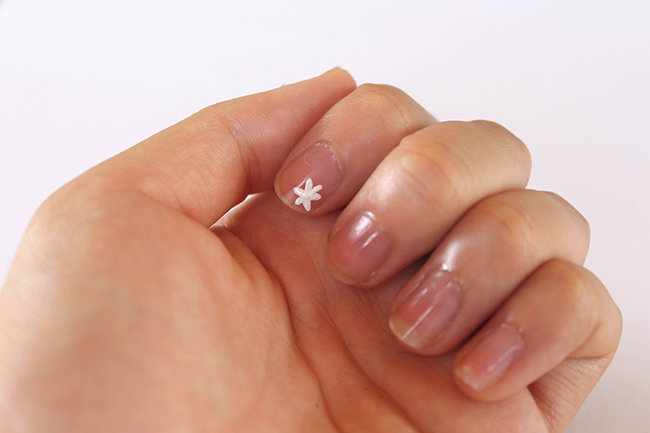 Carefully press the polish side of the toothpick into your nail, near the corner, to create a little petal. Repeat the above step 4-5 times in a rotation to create a little white flower. You will need to add more polish onto the toothpick every 2-3 petals. 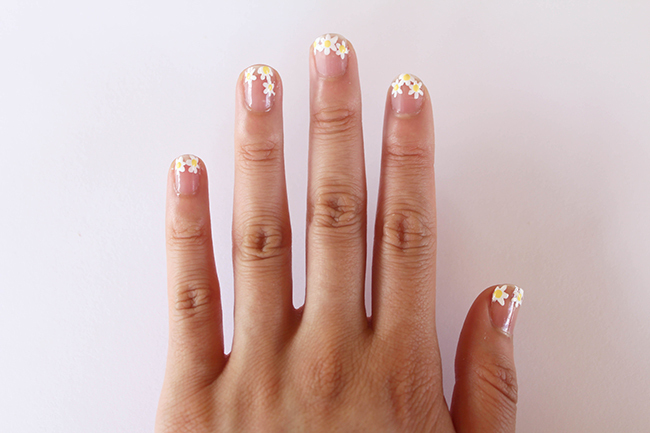 Add 2-3 more flowers onto the end of the nail, depending on how big/small your flowers are. I like to have some of the flowers half off the nail, like the middle one in the above picture. Repeat on the rest of your fingers! 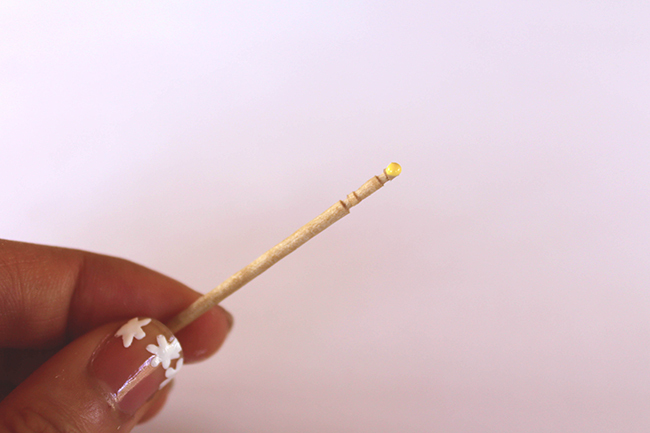 Next, take the end of the toothpick (or a bobby pin if your toothpick is sharp on both ends) and dip it into the yellow polish. 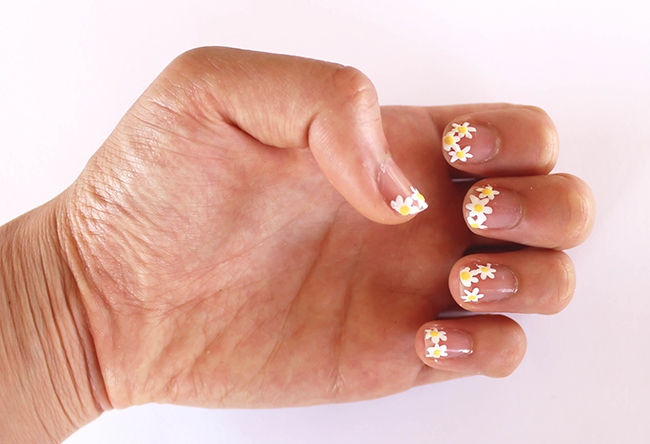 Gently dab the yellow polish onto the center of each flower to really bring the manicure to life. Seal everything in with a top coat, and you're done! One thing I love about this manicure is how low maintenance it is; you don't have to worry about your nails growing out of it since the design is only at the tops of your nails. 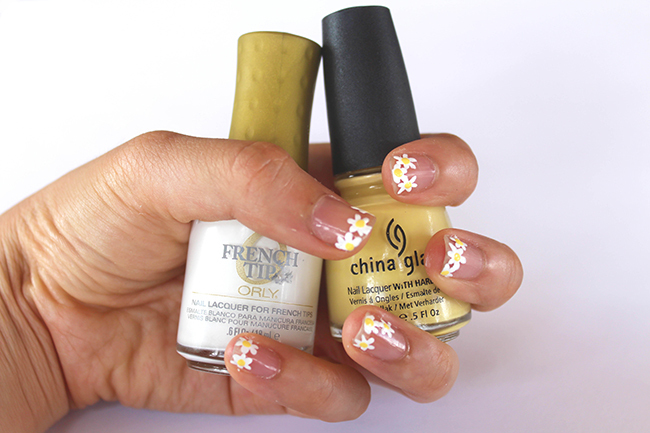 Of course, you could go crazy and cover your enter nail with daisies, or even use different colours to create different types of flowers. Doing this with your non-dominant hand can be a little tricky, but remember that practice makes perfect! Otherwise, you can always ask your friend/sister/mum to help you. Hope you found this tutorial helpful/inspiring; let me know if you try it out! Creative as always - I'm definitely trying this when my current polish starts chipping! How good is the base/top coat you have? I need to find a good one! This nail look is adorable! I am definitely trying it out! Thanks Fabliha, hope you like it on your nails! These are so cute I wish I had to patience to give them a try! just found your blog and this is too cute! wow this is so pretty omg! have to go out and buy me some white nailpolish so i can try this!! This is sooo pretty! I will def. try this! This is so awesome!! Thanks for the details!